A train driver has been cut free from his cab after the service crashed into a footbridge, which had collapsed when it was hit by a tipper truck. A warning message was sent out, but the Nottingham to Norwich service was unable to stop in time at Barrow upon Soar, Leicestershire. The 31-year-old driver, who was trapped for two and half hours, suffered leg injuries. Six passengers were unhurt. Services have been affected and it is not known when the line will be clear. The train driver was taken to the Leicester Royal Infirmary where his condition has been described as "stable" by police. A spokeswoman for East Midlands Trains said the crash happened at about 0633 GMT and was delaying services from Leicester to Loughborough and south from Nottingham. 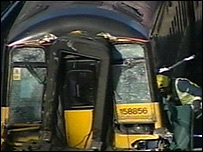 It was also affecting services from Sheffield and Nottingham to London. The spokeswoman said emergency services were at the scene along with Network Rail, but it was not clear how long it would take to clear the line. A special train service is operating between Leicester and London St Pancras and replacement bus services are in operation between Loughborough and Leicester. 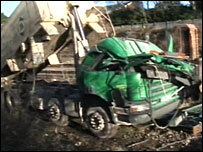 Leicestershire Police said the accident happened after an engineering works tipper truck hit the bridge. The truck driver was cut free from his vehicle but was not seriously injured. A spokesman from the Rail Accident Investigation Branch said inspectors were on site and had started a full investigation but initial examinations showed there was no indication that the condition of the train, track or signalling system caused the derailment. A Leicestershire Fire and Rescue spokesman said: "We had to get specialist rescue equipment to extricate him. "We were working in a very confined space. It was a very slow and precise operation to get the driver out safely and not exaggerate the injuries he had." A spokesman for Network Rail said: "At 6.30 this morning a lorry bumped into a pedestrian footbridge near Barrow upon Soar station, just north of Leicester, causing the footbridge to fall on to the tracks. "An emergency stop message was sent to all trains in the area, but the 0613 Nottingham to Norwich service with six passengers on board was unable to stop and struck the bridge."